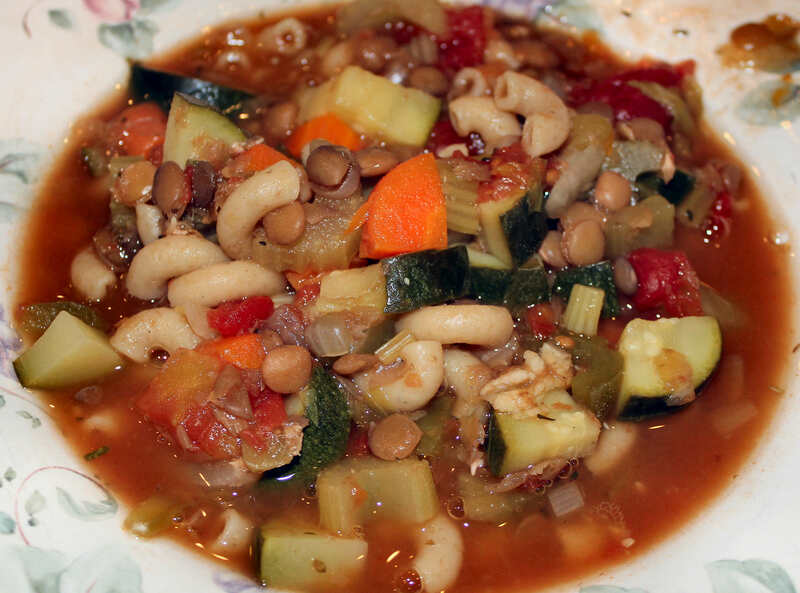 Minestrone is traditional Italian vegetable soup, often featuring a legume and a grain. This one features lentils, macaroni, and zucchini. 1. Spray a large, non-stick pot lightly with olive oil. 2. Sauté onion over medium heat until translucent. 3. Add garlic, celery, carrots, pepper, and zucchini, and sauté until slightly browned. 4. Add lentils, tomatoes, broth, and water. 5. Add macaroni, stir, and cook for 8 minutes until tender. Serving size: 1/8 of a recipe (16.3 ounces). This entry was posted in Recipes and tagged lentil, Lentils, minestrone. Bookmark the permalink.